On Saturday, Halloween, the Indo Jax Surf Team had its final competition of the ESA series. The Eastern Surfing Association, Southern North Carolina District started it’s season in March and held 6 contests along the Cape Fear Coast. Each competitor accumulates points by their placings and hopes to make the podium at the end of the year and be invited to Regionals that will be held in April of 2016. Indo Jax Surf School and Charities is a proud sponsor of the ESA and our Surf Team competes heavily in the local ESA events. Our Surf Team surfers did fantastically. Most all made finals, many solidified podium spots for the end of the year banquet, and a couple earned enough points to qualify for regionals. I am so proud of how the Indo Jax Team Riders competed and feel strongly that we are poised to take over this area in competitive surfing, especially in the girls divisions. Official season point totals are yet to be posted, and we can’t wait to hear the official word. What’s even more impressive is that our team camaraderie and sportsmanship were outstanding, and showed me that our crew is a tight knit team of competitors. Indo Jax Surf School is a learn to surf program located in Wrightsville Beach. 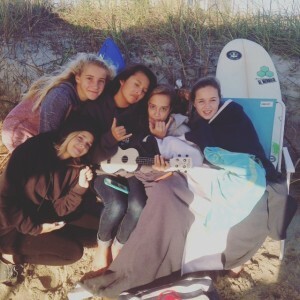 We offer high quality surf camps and private surf lessons in the Wilmington area. Indo Jax Surf Charities is an outreach program for medically fragile, special needs and at risk youth. Indo Jax Surf Club is our after school surf program that serves kids that can already surf, but want to improve their surfing and possibly get involved in our charity and into competitive surfing. Indo Jax Team Riders is our program of sponsoring and promoting surfing at a high and competitive level. At Indo Jax we have it all when it comes to surfing! Our surf instructors and surf coaches are second to none. If you want the best in surfing, come to Indo Jax! This entry was posted on Monday, November 2nd, 2015 at 1:24 pm	and is filed under Uncategorized. You can follow any responses to this entry through the RSS 2.0 feed. Both comments and pings are currently closed.